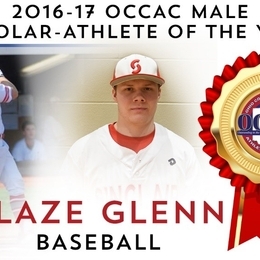 Sinclair Community College and the Ohio Community College Athletic Conference (OCCAC) announced June 21 that freshman baseball player Blaze Glenn is this year’s 2016-17 OCCAC Male Scholar-Athlete of the Year. Blaze Glenn (FR/3B – Toronto H.S) achieved a 4.00 GPA in the classroom this year, while making the OCCAC's All-Academic team and the Dean's List at Sinclair in the fall and spring semesters. He was also named NJCAA 1st Team All-Academic for achieving a perfect 4.00 for the academic year. On the field, Glenn helped lead his team to an OCCAC championship and his team advanced to the Region XII championship game before finishing as the runner-up. Individually, he was named First Team All-OCCAC and First Team All-Region XII. In the community, Glenn donated blood with his team during the annual blood drive and volunteered at the Buddy Walk, Strides Against Breast Cancer, Sinclair Veterans Day Walk, Martin Luther King Jr. Walk and Light the Night. He also helped serve Thanksgiving dinner at the Dayton Boys and Girls Club. This is the inaugural year for this award, which has the following requirements: signed the NJCAA eligibility form for the current academic year, participated in at least one contest, earned above a 3.60 GPA for the current academic year, passed at least 24 credit hours during the academic year and engaged in community service during the current academic year. The voting criteria consists of current GPA (50 percent), community service hours and projects (25 percent) and athletic achievements (25 percent).